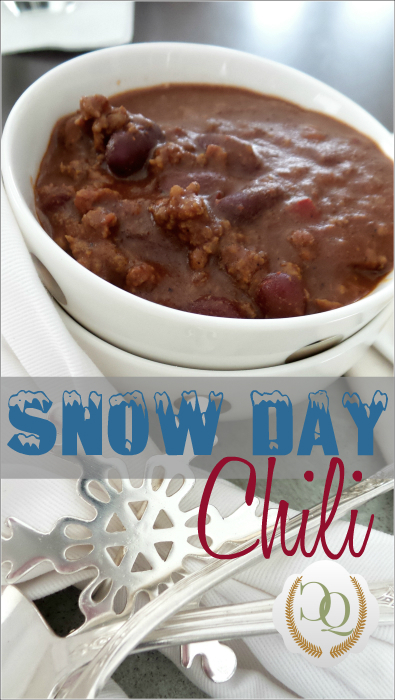 I mentioned that when we had our Snowpocalypse last week, I decided we would have some chili to keep our bones warm. It was cold and our bones definitely needed some warmth...from the inside as well as the outside. After perusing the pantry, I saw that I didn't have all of my usual chili ingredients, so I decided to make do with what I had. Isn't that what a true "snow day" is all about...."making do"?! Believe me, I know this combination sounds bizarre and who would ever put chili IN a chili recipe?! This chick, that's who...cuz a girl's gotta do what a girl's gotta do! I browned and drained the hamburger meat and then dumped it in a pot with the rest of the ingredients. I let it simmer for about 30 minutes. I love the deep, rich color of this chili. I personally do not like a chili that has a strong tomato-y taste because I don't like tomatoes. This recipe had a wonderful flavor....I believe part of that was due to the addition of the cocoa. We would normally serve with cheese, onions, etc., but we didn't have any toppings on hand. We did have some semi-stale crackers and a semi-fresh bag of tortilla chips, so we served it up with those. It was a SNOW DAY and things never fall perfectly into place for a snow day, but eating this chili while watching the snow fall, just made my day! Remind me to share my recipe for Homemade Hot Chocolate on the next snow day...it's delicious too! I may be kicking my regular chili recipe to the curb for this one! Thank you Su, it was very good! HA..possibly! Hugs! Chocolate? I'm going to have to try it in chili. It does look good. Will be waiting for that cocoa recipe. It is very good. You can’t taste it at all, but it makes a much richer flavor for the rest of the ingredients! Thanks so much! Thank you! And yes, you use what you've got...LOL Hope you are having a great week! Hugs! Good recipe. Have never tried Wolf brand. Do they sell that in Alabama? Might have to check at Publix. You know Wallyworld only has limited range. Thank you! You can get Wolf brad at Walmart...not sure about Publix, but definitely can find it in Alabama! This looks so delicious! I'm going to try adding the cocoa powder. A blogger in Canada told me to add cinnamon to my spaghetti sauce and it is so good. And I add instant coffee to the drippings of my roasts-it caramelizes and is something you can't live without. Sometimes the oddest additions are simply the best. Thank you so much! You can't taste it, but it makes the flavors richer and gives it a wonderful color! I agree, sometimes adding something totally different makes a recipe so much better! Hope you are having a great week! Hugs!! except for the cocoa I do that all the time with my chili. even when not snowed in! I do put a dash of time in mine. I've even been known to put a splash of doctor pepper in it! I accidentlly spilled some in it once and loved it! BUT maybe you should just put DP in YOUR OWN BOWL. it you don't like it you wouldn't ruin the whole pot! LOLOL! That is so awesome!! I will definitely give the thyme and Dr. Pepper a try. Those little things sometimes just add so much flavor and give a recipe a little boost! I’m hungry for it also and may make it again this weekend! :-) Love and hugs to you sweet friend! Benita looks so yummy and satisfying. Nothing beats a hearty chili or soup on snowy days. Come visit to check out our crazy snowfall. I love your napkin rings and you styled the photos like a professional. Thank you so much Vera!! I couldn't agree more about soup and chili on cold days! I found those little napkin rings years ago and they have moved with me every time..LOL. Y'all had some CRAZY snow up there..I couldn't get over it...our paltry 8 inches was nothing!! :-) Hope you two are thawing out up there! Love and hugs to you! I think some of my best suppers are when I'm trying to cook out of the pantry and freezer and not go to the grocery store for a while. Your chili looks rich and pretty, Benita. I put cocoa in mine too and I add a bottle of Guiness Extra Stout to mine! Looking forward to your hot cocoa recipe! Thank you so much Dewena! I think those are some of the best meals also…just throw it all out there and see what happens! Oh, I will definitely have to tell the hubster about the Guiness…he loves that beer! Love and hugs sweet friend!! Mmm, it's been awhile since I made chili, this looks amazing! I always put cocoa in mine too, and in my sloppy joe recipe too. Happy Weekend my friend!! Big Hugs to you!! 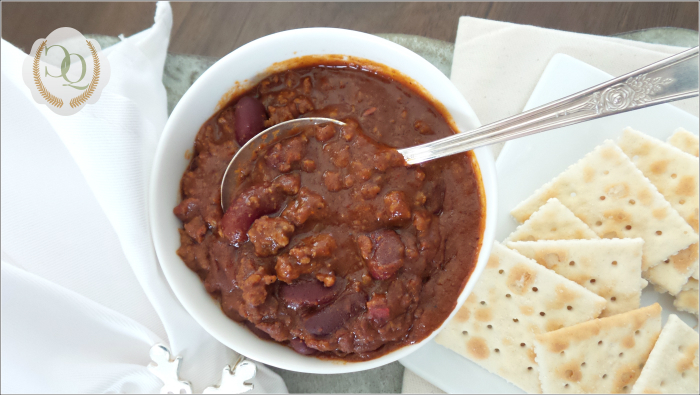 We love chili and I'm going to have to make this recipe this weekend, I think. After responding to everyone, my taste buds are craving it...even with stale crackers and tortilla chips! I love Fritos with it also...the hubster loves dumping on extra cheese!! Since we have no snow, I've been able to get the some things from the store! :-) Big Hugs to you and hope you are having a great week! Good for you! My whole life is built on making do. It causes us to be quite creative, doesn't it? I agree, I think making do is a great way to get our creative groove on! :-) Thanks so much! Thank you so much! Hormel is horrible...truly! Wolf has a decent flavor for canned chili...great as a dip or for using in Frito pie! We find it at Wally World! Love and hugs!! Looks good and just the kind of food you want to eat when it is freezing! Yum...warm on a cold day! Love the snowflake napkin ring. Once again, "great minds think alike!" I have been adding a can of chili to my homemade chili for years. I think it's the unhealthy ingredients in the canned type that make my chili taste so delicious, haha. We are supposed to get 8-12" of snow starting tomorrow night, and we haven't been to the grocery store yet...had better be making a list and heading out while we can! Really? How interesting! I’ve never thought to add chili to chili, but it worked well! HA…all those unhealthy things are always delicious…LOL Hope you bought lots of milk and bread….LOL…cuz that’s what everyone wants during a snow storm….NOT! Hugs to you and hope you are staying warm!! Wow! This reminds me of that stormy day we had a while back, stuck at home with no coffee. We are still recovering. I think the hubster would have convulsions if he didn't have coffee! We always have to make sure it is on hand! Hugs!! How creative you are! I love cocoa in chili! Yours looks so good. Nice and hearty. Now I have to make some! Thank you ma’am! 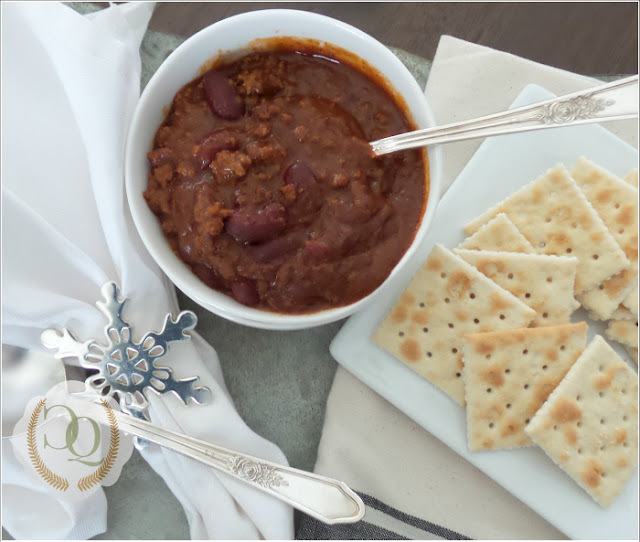 Edward said cocoa in chili is all the rage in Mexico….LOL It was so good and I may have to make some more…that was 2 weeks ago and the cravings are kicking in…LOL Hugs!! Cool! Thank you so much for sharing that!! We will be visiting Hermitage in a few weeks and I'm so looking forward to it. Will check out some of the other places they mention in the article also! We haven't had a chance to visit much of anything since we've lived here....I need to get on a tour bus...LOL Love and hugs to you sweet friend! Look delicious. I love trying new chili recipes so this my next one. Thanks for sharing. I hope you are not traveling too much! Thank you so much! I love trying new recipes also….makes life a little more interesting! :-) We have been on the road…again and again…..lol Hugs! !